Not many of you know that I work full-time at an organic food cooperative. We have a big fruit and vegetable section and every year I am fascinated by the huge impact the weather has on our fruits and vegetables. For example last year, there were almost no apples. The season was terrible and apple farmers couldn’t deliver. We also had an apple juice and apple sauce shortage. I guess you won’t notice these things when you shop at a regular grocery store because they will make sure that your New Zealand apples are all stocked up. But we did notice. But the great thing is that most of our customers aren’t really bothered by things like this. Usually they are pretty well informed about stuff like that. After a really hot summer with a very early and long berry season, I almost couldn’t believe my eyes when the first bright orange kuri squashes went into the wooden shelves. It was still about 30°C hot (plus no AC anywere and we were basically turned into raisins at the office, in the store and at home) and now I was supposed to eat pumpkin soup? Because that’s what I associate with winter squashes. 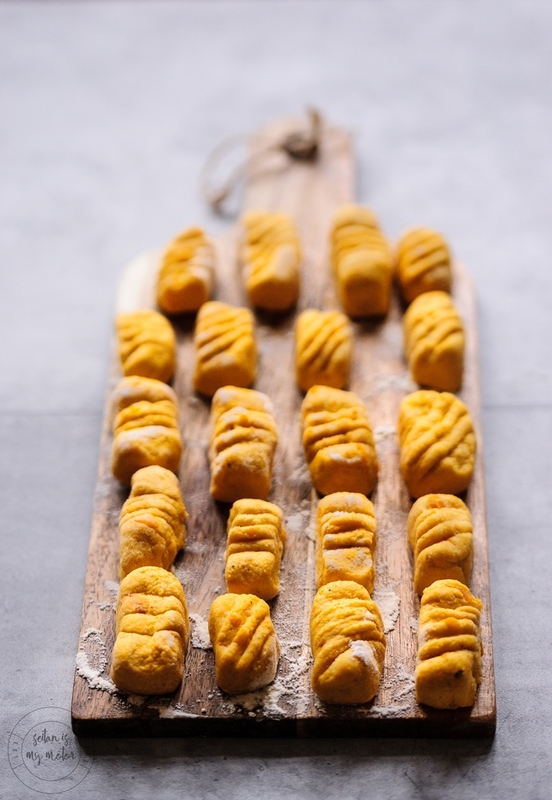 But I guess I have got to be flexible and since I have been obsessed with making gnocchi lately, I went for a batch of pumpkin semolina gnocchi. I used to think this kind of pasta was really difficult to make without eggs. I assumed they’d always come out mushy and wrong textured. But that is absolutely not the case. They are so easy and fun to make! (Yeah, I bet you already knew that.) They are gnocchi alla romana, which means there’s no flour involved. (Okay, I did use a little bit to make up for the omitted eggs). The recipe is so easy that I’ll have to bombard you with pictures here. There’s not much to write about when it comes to the method. You need a small red kuri squash (or something similar), which is cut in half. You don’t have to peel it, just get rid of the seeds and slice the squash in stripes. Bake them at 200°C for about 20 minutes or until soft. Let cool and cut of the skin. (Or leave it on and purée the squash.) If you decide to cut off the skin you can just mash the baked squash meat in a large bowl. Cut the squash into half, remove the seeds and slice the squash. Place on a baking sheet lined with parchment paper and bake until soft, for about 20 minutes. Let the squash cool and remove the skin. Mash the squash meat in a bowl and mix with semolina, flour, and salt. Knead into a ball and let rest for 10 minutes. Roll the dough into several thin logs and cut off 2 cm long pieces. Shape the gnocchi with a fork and set aside. Add about a third of the prepared gnocchi and let simmer until they start to float. Remove with a skimmer and place on an oiled cutting board. Pour oil into a pan and fry batches of the gnocchi. Add fresh basil and serve immediately. Toll zu lesen! Und nettes Rezept. schön wieder von dir zu hören! I have only tried making gnocchi once many years ago and it was a total failure because the recipe was terrible. But I have been feeling inspired to try again. 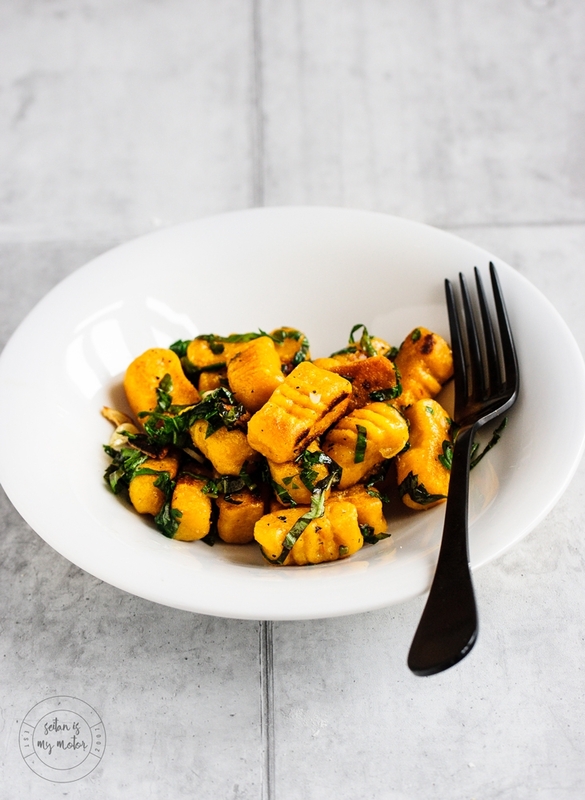 Pumpkin gnocchi sounds delicious. I am sorry you had that experience, Susan and I can totally understand! Shaping them is somuch work and if a recipe fails you that is so frustrating! I am part of a CSA, which pretty much means (in my case) that I pay a single farm a lump sum at the beginning of the year, and I a certain portion of their produce for entire season. So from June to November I am at the mercy of the weather. But it does put in perspective what eating locally means. One year it got too warm too early and all the peach trees bloomed only to die off because there was still a few frosty nights. I was so sad, and didn’t really get to eat any peaches for a year! And when I tell friends that we haven’t had any tomatoes, or eggplant because it isn’t “in season yet”, I get a lot of weird looks. I think people forget that even at farmers markets their produce is coming from fairly far away. Yes, that is so true! Sorry to hear about your peaches, but that is really how it is. It’s really funny that in Germany people usually eat tomatoes all year long, even though most of them come from greenhouses in Spain during the winter (where people harvest them unde the most terrible conditions) but they make exceptions for asparagus and strawberries. These are only eaten when in season. I think it would probably be very helpful for the environment if we ate more seasonal food altogether. I am so looking forward to make these gnocchi. 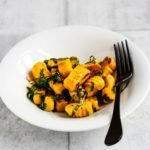 I have only made gnocchi once, they were with sweet potato and I loved them so much that I wanted to eat them every day! Also, I am delighted that you have made these with semolina flour, because I have a bag of it in the pantry and I have only made cookies with it. Does the semolina flour make the gnocchi extra soft and light? Do you take the gnocchi out of the water as soon as they start to float (my sweet potato recipe says to let them float a few minutes) because if not, they will become soggy? Thank you for all your delicious recipes (I have made quite a few!)! No, they are chewier than regular gnocchi but I really loved that texture. And I also had to uses my bag of semolina. I take them out as soon as they are floating but I guess you could experiment with that. Thank you for trying my recipes, Yvonne. I really appreciate it. nice to hear from you – and your gnocchi looks delicious. 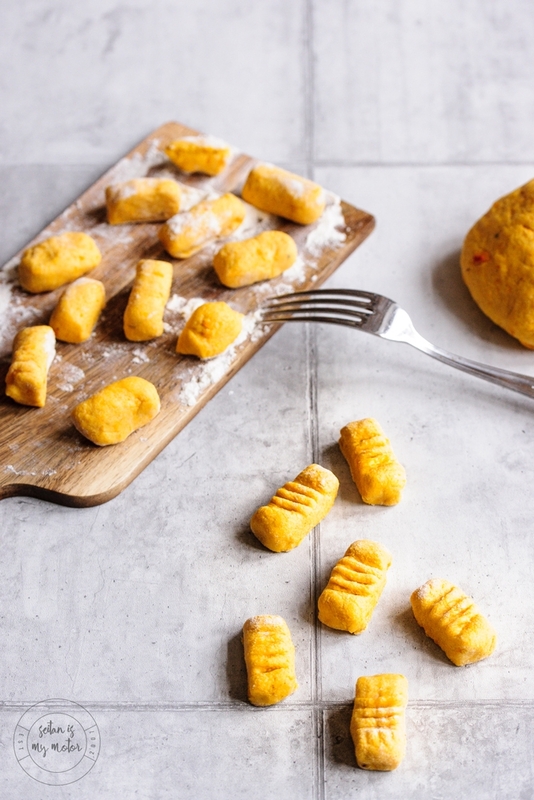 I confess I don’t find making gnocchi easy – well maybe it is easy but it is time consuming – perfect for some mindfull activity but less great when rushing around. Sounds awful not to have apples but it is nice to be honest about your food and in touch with nature in this way. I was just talking with friends yesterday at how there are so many strawberries in the supermarket but none yet at the farmers market – it puzzles me! Nice to hear from you, too,Johanna! Yes, you are totally right about the time consuming aspect but I guess I do this kind of stuff for stress relief. So I don’t mind. But I get if people do! We get the supermarked strawberry thing every year, too. Here, they ship them from Spain until they are in season in Germany. But I only ever buy the local kind because they do taste better and I can get them without being covered in plastic.